McEvoy Olio Nuovo extra virgin olive oil - McEvoy olive oil is uniquely blended to highlight the rich fruit flavor & distinct peppery finish characteristic of this seasonal oil. Olio Nuovo is bottled immediately, & never stored in the resting tanks. The natural sediment remains in the bottle & the vibrant color remains intact. 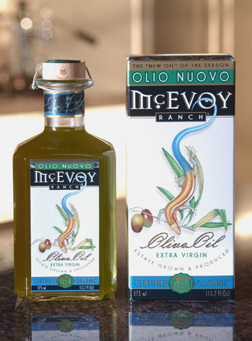 McEvoy Olio Nuovo has a rich consistency & an intense, full-bodied flavor. The bottling of McEvoy Olio Nuovo marks the conclusion of yet another successful harvest, & the time for true thanksgiving & celebration to begin. Olio Nuovo is pressed from olives grown on the legendary McEvoy Ranch in Petaluma. McEvoy early harvest extra virgin olive oil is a blend of six Tuscan olive varietals. McEvoy of Petaluma is truly an olive oil lover's oil! This golden to green olive oil serves as an exceptional complement to any culinary creation. This limited-production "new oil" will be available for shipping on Dec. 1st. 2013. Simply order & enjoy the harvest! McEvoy Ranch Olio Nuovo Extra Virgin Olive Oil.